One of the best aspects of home ownership is having a place to make lots of memories with your friends and family. 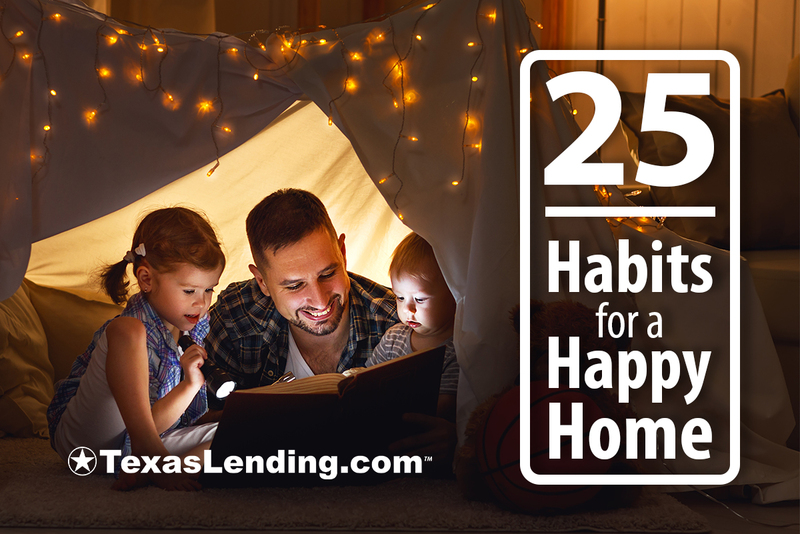 These 25 habits for a happy home, will help you make the most of your home. Consider changing up your daily routine to include these ideas for a happy home. Sunlight increases the production of serotonin in our bodies. Serotonin is also known as the happiness hormone, because it is thought to contribute to feelings of well being and happiness within the brain. Along with letting sunlight into your home, you should open the windows and let in some fresh air too. Chemical residue from cleaners, lingering food smells, and other odors in your home are easily remedied by letting the fresh air in from outside. How much time each day do you spend looking for your keys or remote? A little organization could restore some simplicity to your happy home. Rather than waiting until the dishes or laundry are in dire need of cleaning, develop the habit of cleaning a little at a time. Being tidy during your day, takes the stress away from having big messes to clean. Spend time in your backyard and appreciate the nature around you. This is not only a great way to relax, but it helps you get a bit of sunshine and fresh air. Making the time and space to do the things that you truly enjoy is a great way to build a happy home. Your home shouldn’t just be a place to sleep and eat, create a kitting, reading, model building, collecting, drawing, or dancing happy space. If you find that your family spends a lot of time apart, you may need to find ways to reconnect during the week. Plan a weekly or daily technology-free meal together, have a regular movie night, or game night in your happy home. Socialization is proven to increase your happiness. When you have the time, make an effort to invite your friends over to your home. We live in a world full technology and distraction. Set some time for yourself and your family to unplug from technology… it can be more rejuvenating than you might think. Making memories in your home helps build happiness. Holiday traditions or just a fun tradition that makes your family unique can make life-long memories to revisit or pass along. There may not be a more memorable or happy place than a backyard fort. Laughing together is one of the best ways to create a happy home. Play hide and seek, sing karaoke, or start a water balloon battle. Add unique artwork to your walls, vacation photos, or just some colors that make you smile. We all need a place to unwind, ensure that your happy home has a place for a quite moment or two. Sleep plays a major role in your health and happiness. Everyone in your house hold should have healthy sleeping habits. Working out leads to changes in your brain, with increased blood flow, new connections of neural pathways, and the release of endorphins. This aides your memory, overall health, and your happiness. Gardening is one of the best ways to improve health in your happy home. Read more about the benefits of gardening in this article. Listening to music is another activity that can benefit our brain and change out mood. Play music for everyone in your home and dance or just listen to your favorite songs on your headphones. Taking the time to enjoy making a healthy or special meal is a great way to add happiness to your home. One of our previous blog posts gives you a number of ways to connect to your neighborhood. There are a lot of people who love animals, but you may not know how beneficial it can be to have a furry friend. Read more about the benefits of having pets in your home, here. One of the best ways to find appreciation for your home, is to leave it for a little while. Bring back some great memories to your happy home. Feeding your body with food that increases your health is a crucial habit to increasing your happiness. Clean the junk food out of your pantry and be more mindful of what your are eating. Developing an appreciation for your life and the things you have is a powerful habit for increasing happiness. Making an effort to help others is rewarding. Find ways to work together with your family to help others. Although it seems a bit backwards to say that smiling leads to happiness, but it can be helpful. Smiling is an activity that can trigger the release endorphins within your own body and other people around you. We want our customers to have happy and healthy homes. These 25 habits for a happy home are small ways to add joy to your life. As a mortgage company that cares about our customers our goal is to write helpful information about all aspects of home ownership. If you are ready to buy a home or refinance your current home, reach out to us today to get started.